WorldMovieStore - Scott Pilgrim vs. the World Sinopsis. Scott Pilgrim (Michael Cera, Superbad) is an accidental heartbreaker, a Canadian slacker who obsesses over the girls who've dumped him but hardly realizes how he's dumped other girls. Unfortunately, Ramona has some serious baggage: seven deadly exes, and Scott must battle them all if he wants to date Ramona. 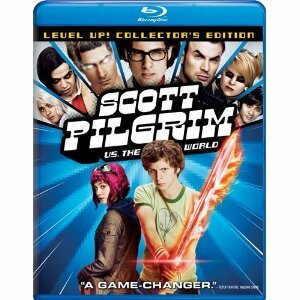 Scott Pilgrim vs. the World is saturated in pop culture, particularly video games. --Bret Fetzer. Read More Sinopsis. 0 Response to "Blu-ray Release Scott Pilgrim vs the World"